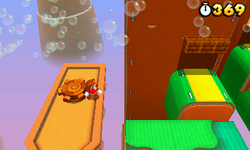 World 8-3 is the third level of World 8 in Super Mario 3D Land. This level requires 80 Star Medals to unlock. Its main theme is rotating cardboard platforms and the main enemies are Rocky Wrenches. The first section is made of giant cardboard boxes connected via rotating cardboard blocks and cylinders. Some Rocky Wrenches pilot small airships to toss wrenches at Mario. After the Midway Flag, Mario must cross more rotating plaforms until reach a pending platform which takes him to a Warp Box. It transports the player to another swinging platform. In the end, a safe area is found, containing two tiny carboard lifts and the Goal Pole. Star Medal 1: The player should start the level with a Super Leaf. After the first set of rotating platforms, the player will come across a gear. They should continuously whack the gear with the Tanooki Suit until they reach the medal. Star Medal 2: After the checkpoint, there will be a multitude of rotating platforms. The second medal is found on one of the platforms at the top left corner. Star Medal 3: At the end of the level, this medal can be found at the lower portion of the final rotating platform.